Christmas Down Under is quite different from Christmas in northern climes. Australia’s Christmas customs are drawn from a unique blend of cultures, mixed with outback ingenuity, and a bit of hot weather. While people in the northern hemisphere experience cold temperatures and dream of white Christmases, Australians celebrate a sun-and-surf Christmas. Christmas trees on the beach are a common sight on Christmas day in Australia. The Christmas season arrives in Australia with much pomp and pageantry. Cities and towns all over the continent welcome the season with elaborate parades. Hundreds, even thousands, of people take part in these parades as costumed characters, bands, dancers, riders on amazing floats, and more. Hundreds of thousands more people line the parade routes to enjoy the sights and sounds of Christmas and to welcome Santa Claus. In 1838 the town of Hahndorf was founded by German Lutheran families who brought their German traditions with them. On the night of December 5 the people of Hahndorf celebrate St. Nicholas Night. Santa Claus dressed in his bishop’s apparel as St. Nicholas comes to town accompanied by two “Black Peters.” They arrive in a candlelight parade giving treats to children along the parade route. As St. Nicholas passes the townsfolk join the pageant which ends at a candlelight caroling service. At the service people get to enjoy another German tradition as St. Nicholas passes out gingerbread men to the attendees. Festivals are a big part of Australia’s Christmas season. During the week before Christmas eve in Queensland the Christmas Lantern Festival is held. There are parades to watch, concerts to go to, dances to participate in, and nightly fireworks displays. Adults and children alike enjoy Christmas plays including an interactive “First Christmas” nativity scene where they can pet the animals and talk with the actors. The highlight of the Christmas Lantern Festival is “The Night the River Sings,” a parade of decorated and lighted boats. Commercial and private boats cruise the Brisbane River competing for prizes. Another major festival is Darling Harbour’s 12 Days of Christmas festival in Sydney. Once again a parade, led by people dressed as Mary, Joseph, and Baby Jesus, opens the festival. Every night of the festival people take in a number of acts including acrobats, jazz musicians, barbershop quartets, actors, Christmas carolers, and rock-and-roll musicians. Australians love to get together to sing Christmas carols. All across the continent in many towns and cities people gather to sing carols by candlelight. Carolers join large choirs, popular musical acts, as well as local church, school, and community groups for evenings full of good music under the calming light of dozens of candles. The best known gathering is held in Sydney’s Royal Botanic Gardens at a natural amphitheater called The Domain. The Sydney Philharmonic Choir may, at times, be seen here. This is one of the events televised throughout Australia, New Zealand, and Southeast Asia. Revelers going to the “carols-by-candlelight celebration” held at the Emerald Lake Park can make the trek on the Puffing Billy Carol Train. Riders board the train in the town of Belgrade, 25 miles from Melbourne. A shiny steam engine pulls the train to the Emerald Lake Park where people enjoy and purchase food, Christmas goodies, and decorations as well as the singing. All proceeds from the ride benefit the William Angliss Hospital. Christmas Eve is a time for preparing for Christmas day. While Christmas Eve is not a public holiday schools are closed and some offices close early. Stores stay open so the last-minute shopper can buy all they need for the big day. Christmas Eve church services, as well as services held on Christmas Day, are well-attended. At St. Peter’s church in Adelaide there is even a children’s Christmas Eve service held late in the afternoon. Carol singing is a major part of these services. As evening turns to night children hang their stockings on the bedposts or near the fireplace. Instead of cookies and milk, children in Australia leave chocolate cake or lamingtons, sponge cake cubes covered in chocolate icing and dried coconut, and ice-cold lemonade for Santa Claus and carrots, other vegetables, grass, and a bucket of cool water for Santa’s reindeer. 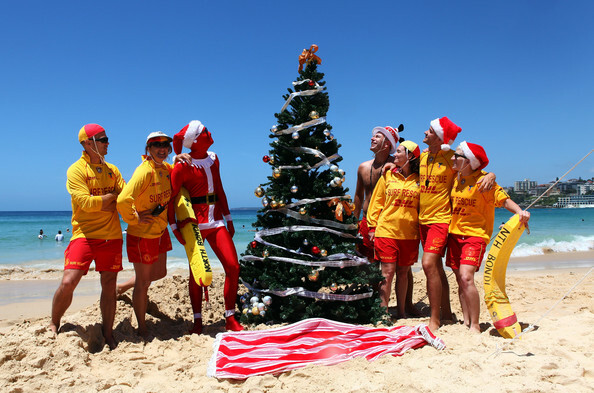 Christmas Day arrives in Australia’s early summer months. Temperatures often range from 80 degrees Fahrenheit to 100 or more degrees Fahrenheit. In this heat it is no wonder that many Australians spend Christmas day out-of-doors at the beach or some other venue. Upon waking up, children dive into their stockings filled with wonderful treats and other goodies. The presents under the tree, however, are left until the parents wake. After the tree is plundered families head to an outdoor celebration, to grandparents’ home, or to an aunt and uncle’s home for more presents and a wonderful Christmas dinner with the extended family. The beach is a favorite place for many Christmas celebrations, but one of Australia’s many parks is also a choice place to spend the Christmas holiday. While the beach offers swimming, music, and pick-up games of volleyball and soccer, the park offers hiking, gaming, and lots of shade from the hot summer sun. No matter where one goes there will be some great picnicking going on.